Everyone loves to play and we seem to do it so naturally… but for the brain, play is hard work! 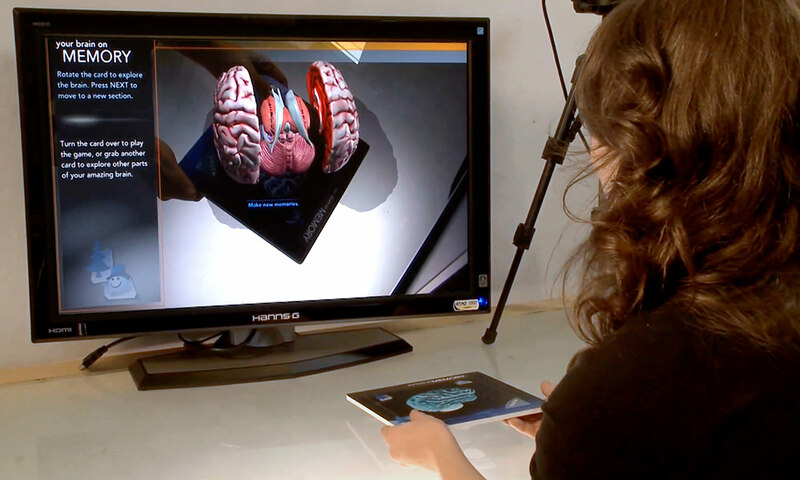 To demonstrate that, Perfect Prototype set out to create an augmented reality brain – a virtual brain – for the “YOU! The Experience” gallery at the Chicago Museum of Science and Industry. Unified Field and Thinc Design partnered with Perfect Prototype. The exhibit lets visitors play four “games” by holding a brain – an augmented reality brain – in their hands and maneuvering it to find out how their brains did it for them. The user chooses any or all of eight, fun learning modules, each one displaying dramatic 3D models and astonishing animation. And the entire experience takes place on one small tabletop using a simple 2D card. That’s the impressive flexibility of augmented reality technology. This activity explains how the brain visually recognizes and manipulates objects and shapes. Users rotate a virtual puzzle piece that is hovering above the 2D card in their hands, and insert the correct piece in the matching keyholes. To teach how the brain reacts to music, beats, emotional tone, and learns how to play instruments, this musical game creates a virtual keyboard that plays notes and asks the user to repeat them back in an increasingly difficult sequence. The tabletop turns into a ball-drop zone in this game, as the user tries to catch balls – basketballs, golf balls, even cue ball – in a cup and then compare his or her skill as a novice against the brain of a professional. For this game, the hand-held card becomes a playing field. The player must remember and correctly match 3D objects as they appear in front of him. The lesson: how the brain stores memories, grows neurons and dendrites, and communicates over synapses. Replicas of the augmented brain are available for sale. Contact us for specifications and pricing. experiences is what we do.